As on all Southern Crossings tours, you´re taken care of from beginning to end – airport/dock transfers and domestic flights are included! 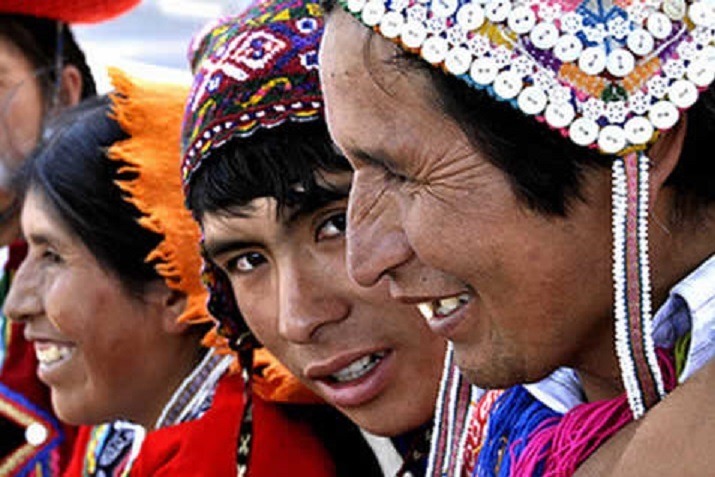 Depart any day and customize your Peru tour at no extra charge! We are family tour specialists. Add on: Pacific Beach Getaway, free days or extra activities. Explore Peru on a 21-day tour. Peru has it all, from deserts to high mountains to pristine Amazon rainforest, along with the remains of some of the most fascinating and mysterious cultures anywhere in the world. And our 21-day adventure covers it all. From Lima we fly to Puerto Maldonado and take a dugout canoe to a jungle lodge deep in the tropical rainforest. Then we explore the imperial city of Cusco and the Sacred Valley, trek the Inca trail to Machu Picchu (or spend three more marvelous days in and around the city of Cuzco), cruise across the world’s highest navigable lake, Titicaca, and view condors in the Colca Canyon. Then after flying back to Lima, we head down the coast to fly over the mysterious Nazca lines. Day 1: Arrive Lima. City tour today or upon your return. Day 2-3: Flight to Amazon Lodge. Excursions by boat and on foot to view flora and fauna. Day 4-5: Flight to Cusco. City and ruins tour, then free day or optional activity. Day 6: Sacred Valley tour – Pisac and Ollantaytambo. Day 7-10: Inca Trail/Machu Picchu. Day 11: Return to Cusco and free time. Day 12: Journey to Lake Titicaca, visiting Raqchi ruins, Andahuaylillas and the Pukara Museum in route. Day 13-14: Lake Titicaca islands tour – Amantani, Taquile and the floating islands of Uros. Day 15: Travel to Colca. Day 16-17: Colca Canyon tour, Arequipa city tour. Day 18: Flight to Lima. Free day or city tour. Day 19-20: Nazca overflight and south coast tour. Arrive in Lima anytime today and private transfer to your hotel. If arriving during the day, your hotel will be in the neighborhood of Miraflores, with good artesan markets and restaurants, and you’ll have an included city tour in the afternoon. The city tour lets you explore the wonders of the colonial capital, you visit the famous Plaza de Armas, as well as the impressive Cathedral in the Plaza and the beautiful San Francisco church. You also get a chance to take in some beautiful views of the coast at Parque de Amor. Lima City Tour – Option 2: Larco Museum & Huaca Pucllana (upon request). Let us know if you would prefer this tour over the Cathedral Tour (or both for an extra fee). We could also plan a tour of the Huaca Pucllana at night if you have time in Lima. The site is lit up until midnight and looks amazing! The Larco Museum is housed in an 18th century viceroyalty-era mansion. Surrounded by beautiful gardens, the Larco Museum is a stimulating and inspiring space in which visitors can enjoy and learn more about the fascinating history of ancient Peru. The cultures gallery provides a clear and captivating narrative account of more than 5000 years of pre-Columbian Peruvian history. Visiting the Larco Museum with their more than 45,000 meticulously catalogued archaeological objects, is a unique experience. The Archaeological Complex “Huaca Pucllana” was an Administrative and Ceremonial Center of the Lima Culture, a society that developed at the Peruvian Central Coast between 200 AD and 700 AD. Located in today’s district of Miraflores the “Huaca Pucllana” was built around 500 AD. “Pucllana” is one of the most important ancient monuments in Lima. Based on the “Huaca Pucllanas” architecture and found objects, it is believed that the complex was the heart of development of the “Lima Culture” and served as a ceremonial and administrative center. If arriving late at night, you’ll be close to the airport for a bit more sleep before your next day’s flight, and you’ll have your city tour of Lima upon your return. You’re off to the Amazon basin this morning! After a short flight, you arrive in the city of Puerto Maldonado and transfer to a motorized dugout canoe for the trip upriver to the jungle lodge. The cabins at the lodge have modern bathrooms and comfortable beds with mosquito nets, and the food here is great. Take an afternoon walk through the rainforest with an experienced naturalist guide, come back for dinner, then set off again for a nocturnal jungle canoe ride to spot caiman! The next day’s activities will include a visit to an oxbow lake to look for giant river otters, monkeys, macaws and other wildlife as well as jungle walks led by an experienced, English speaking guide. You’ll witness an array of medicinal and otherwise interesting flora and fauna, as well as gain some insight into native Amazonian peoples and traditions. Early rise to catch a canoe back to Puerto Maldonado then a short flight brings us to the famous Inca city of Cuzco. After checking into your hotel, you´ll set out to explore the incredible capital of the Inca Empire. We head to the picturesque Plaza de Armas to the cathedral to see the colonial influence in the city, and we can admire the stunning architecture of the church and also the native influences subtly woven in into the artwork. Onwards to Qoricancha church, where the colonial and Incan architectures are on display side-by-side directly contrasted with each other. Afterwards we make our way above the city to the imposing fortress of Sacsaywaman where we can marvel at the incredible stonework and architecture of the Inca civilization. We head back to Cuzco in the late afternoon. Free day in Cusco there is plenty to do in the Incan capital. There is the opportunity to visit Cusco’s excellent Inca Museum, retrace the steps of the conquistador Pizarro and the Inca rebellion that almost retook Cusco, take walks to little known Inca sites above town, and generally take in the splendor and beauty of this fascinating region. You will spend the night in Cusco. Today we head to the Sacred Valley to visit the ruins and market of Pisac and then Ollantaytambo. Besides the huge and fascinating ruins above the town, Ollantaytambo is the only Inca village still inhabited today. Walk its narrow streets and peer through huge Inca doorways into courtyards where life has changed little in over 500 years. Early to bed, as our trek along the Inca Trail begins tomorrow! (If you’re not into the Inca Trail, there is plenty to do around Cuzco, walking the ancient streets, sampling the many cafes and restaurants, shopping for Andean goods, or trying some other activities such as horseback riding, biking or rafting. Our Cusco representative will be available during your stay and help you plan these activities). Early this morning we start walking the Inca Trail towards Machu Picchu! A morning drive brings us to kilometer 82, start of the world-famous Inca Trail trek. Our first day is an easy one to get acclimated, as we gently climb through Andean valleys to the village of Huallabamba, making our first camp just above it. Along the entire trek we are well taken care of by our team of porters and cooks, freeing us up to fully enjoy the Inca sites and vistas unfolding before us. Parakeets, bromeliads and the major Inca site of Llactapata are some of today’s highlights. Tonight we camp at Wayllabamba. Estimated hike time 5-7 hrs. Everyone may hike at their own pace. Tonight we camp under the Andean sky. Up up up to Dead Woman’s Pass (Warmiwañusqa) as we pass through several ecological zones and microclimates to the highest point on the Inca Trail. Near the top of the world at 4200 meters (14,000 ft.) the air is thin, but the view is not to be believed. We then continue on to Paqaymayo, tonight’s campsite. On the way we will see more archaeological sites along the trail. Estimated hike time 6-8 hrs. Today we continue trekking past three of the most beautiful Inca sites anywhere in Peru: Sayacmarka, Phuyupatamarka, and Winyaywaina. We camp at Winyaywaina or nearby. A pre-dawn departure brings us to the Gate of the Sun to watch the first rays of sunlight strike the sacred city of Machu Picchu. Known as one of the greatest architectural achievements in the world, this historic sanctuary is considered one of the seven man made wonders of the world. After a guided Machu Picchu tour, take your time and enjoy this magnificent place. During peak visiting hours (10-2), try a hike on one of the surrounding Inca trails on Wayna Picchu or Machu Picchu Mountain. In the late afternoon we’ll catch a train back to a hot shower and the other comforts of Cusco. 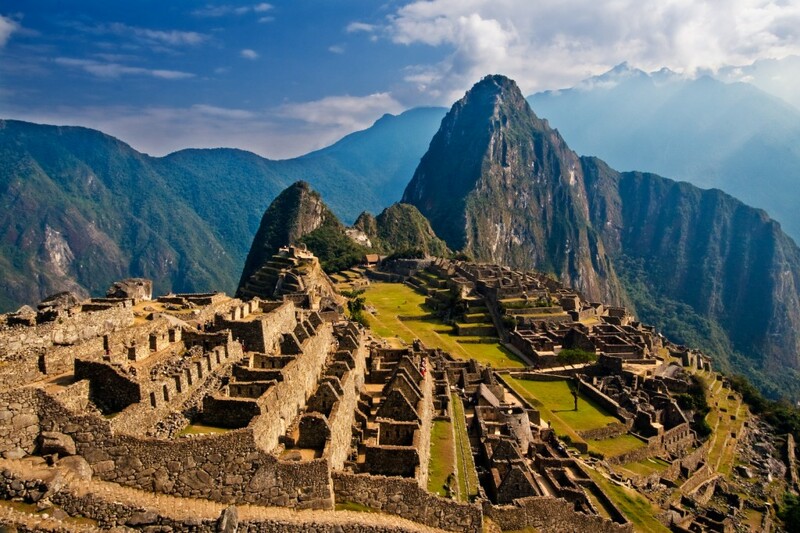 Add an extra night and day at Machu Picchu to your itinerary if you wish. plus the distance you hike at Machu Picchu. Today we catch the train back to Cusco. We have the rest of the day in Cusco to visit artesan markets, visit more museums, churches and Inca sites, participate in an optional activity such as horseback riding or mountain biking, or just relax with a coffee on a plaza balcony. Overnight in Cusco. This morning we head down to Puno on a guided bus tour. The trip there is beautiful, as we pass by Andean villages, herds of llama and alpaca, and high snowcaps. We stop at the Inca site of Raqchi, the old colonial church at Andahuaylillas and the Pukara Culture Archaeological Museum. We arrive on the shores of Lake Titicaca, the world’s highest navigable lake at 12,500 feet above sea level, and get to relax before the tour of the lake the following day. Boats are the transport theme today as we head out across the waters of Lake Titicaca. Our first stop is the islands of Uros, completely constructed out of totora reeds and floating on the surface of the lake. We’ll take a walk across the spongy surface of these unique islands and go for a ride in a reed boat before continuing on to the island of Amantani, where we’ll spend the night with a local native family. A soccer game with the locals, an amazing sunset, and a music and dance fiesta in native garb are all on the agenda on the island today. Please note: our Lake Titicaca family stay is a truly authentic experience which includes being cooked for by and dining with the local family and staying in a room at their house. There is often just candlelight, no electricity, and the bathroom is an outhouse. This is a great experience which is the highlight of many people’s trip, but which can certainly be described as “basic” or “roughing it”. If you do not wish to spend the night on the islands, Taquile and the floating Islands can be visited on a day trip instead. The native culture of Taquile is the most intact in probably all of the Andes, with its inhabitants maintaining the same customs and dress as they have for over 1000 years. Taquile Island is famous for its textile art that has been declared a UNESCO masterpiece of oral and intangible heritage of humanity. You will truly feel as though you have gone back in time as you walk the ancient stone paths of the island and observe its people. Afternoon boat back to Puno. A morning journey by private transport to Colca Canyon gives us a great opportunity for sightseeing and visiting some nice places on the way. Then we head to our hotel to spend the night and relax. Early morning departure for the Colca Canyon, one of the world’s deepest. Keep a lookout for condors as we skirt the side of the canyon. This area also has some of the most extensive Inca and pre-Inca terracing in all of Peru. In the afternoon there is a chance to soak in the town’s thermal baths before heading to your hotel in the village of Chivay. A morning journey by private transport to Arequipa. Arequipa is a charming colonial city at the foot of El Misti volcano, with the Colca Canyon just a few hours away. On our included city tour, we’ll visit the huge and beautiful Santa Catalina Monastery as well as the Museum of Juanita, the Inca Ice Mummy. This morning we fly back to Lima and have the day there for sightseeing, shopping or museum-hopping, or an included city tour if you haven’t already had one. Morning departure for Nazca. On the way we’ll visit a wine and pisco vineyard and distillery and go sandboarding and dune-buggying at the Sahara-like oasis of Huacachina! Morning flight over the mysterious Nazca lines. We have the afternoon free to visit the nearby Nazca cemetery and aqueduct system. You’ll be transferred to the bus station in Nazca for the return journey to Lima and back to the hotel. Departure day. Your international flight may depart anytime today. Private transfer to the international airport included. Is this trip for me? Peru Explorer: is a 21-day tour which includes a four-day moderate trek (optional), no trekking experience is required, but one should be in average physical shape and not suffer from any heart or respiratory conditions. The trip also includes visit to a rain forest lodge, a small plane flight over the Nazca Lines, high-altitude walks of up to 45 minutes and a basic family stay on Lake Titicaca. The rooms with the family are twin-share and very clean, but also very basic, often with no electricity and always with the bathroom outside the house. It is possible to visit the Titicaca Islands on a day trip if you would prefer. The trip also includes some public transport, walking around ruins and during city tours. As always, a certain patience is required for the inconsistencies and occasional delays of developing-world travel as you explore peru. On all Southern Crossings tours, you are met at the airport by one of our representatives (holding a Southern Crossings placard), who will accompany you to our joining hotel. No bargaining or being swindled by airport taxis! International flight to/from Lima, pre- & post- tour accommodation, visas, vaccinations, personal insurance, meals except where specified above, drinks, laundry, souvenirs, tips while on optional excursions and other items of a personal nature. Medical travel insurance is not included through Southern Crossings, cancellation insurance is advisable. In Lima/Cusco/Arequipa/Machu Picchu/Puno: $150 double/$130 single. Add extra activities such as river rafting, horseback riding, mountain biking, hiking, climbing, zip lining, surfing and free days to your custom itinerary. Ask about these options and we’d be happy to add them to your quote. If you have any special requests or interests like birding, cooking or crafting that you would like to explore please let us know! This tour includes 3 star hotels. We would be happy to give you an upgrade to four or five star. If you would like to select a specific hotel let us know your preference. We can then work it into your custom itinerary. Please add this to your total payment if you will be travelling alone. All travelers to Peru are required to have a passport valid for at least six months from date of entry. Visas are not required for E.U., U.S., Canadian, Australian or New Zealand passport holders. For other nationalities, please consult the nearest Peruvian embassy or consulate. An onward ticket and proof of funds may also be required at entry and should be available to show to immigration. Traveler’s checks, currency, or a bank statement, from the bank or printed off the internet, are sufficient for proof of funds. Travelers may wish to receive hepatitis vaccinations and should be current on all other standard vaccinations. The rainforest area of Peru (approx. 3500 ft. and below, east of the Andes) is a malarial and yellow fever zone. The yellow fever vaccination is reccomended and travelers may wish to take malarial prophylaxis. Please consult your physician or local health department for more information. It is best to bring from home such items as prescription medications, eyewear and care, unusual film and camera batteries. Please bring any used batteries home with you to recycle! Please note: We provide a sleeping bag, foam mat, and of course tent. While hiking the Inca Trail, porters will accompany us to carry most of our things, including all the camping gear. Each passenger is allowed 15 pounds of personal items which will also be carried by the porters. Such items would include warm clothing for camping, toiletries, a book, music, or other entertainment, etc. During the day we’ll be using a daypack and will just need to carry water, snacks, rain gear, and a layer or two for changing weather conditions. Most people also carry a camera. For your international flights, please check with your airline. Within Peru, you are allowed 20 kilos (44 lbs) of checked baggage, as well as one carry-on and another small, purse-like item. The carry-on size regulations are the same as international carry-on size regulations. Cusco, the Sacred Valley and Arequipa: days are warm if sunny, slightly chilly if cloudy. Nights are cold in Cusco. Machu Picchu: similar to Cusco, but warmer and with more chance of rain. Lima: warm to hot days, cool evenings, almost never any rain. Nazca: dry and warm desert climate which can be cold at night. Amazon basin: hot and humid year-round. We recommend light clothing (in weight and in color) that fully covers arms and legs to avoid mosquito bites. Phone w/country, area code and best time to reach you? Destinations/tour you are most interested in? When are your tentative or set travel dates? How many people will be travelling with you? How did you hear about Southern Crossings South America? Southern Crossings did an excellent job of organizing our tour. They checked with us during the tour to insure that everything was to our satisfaction. It was a hassle free vacation. Special mention to Kris, Alciria, Ivan and Pedro for their part. We would use Southern Crossings again in the future and recommend their services to our associates and friends. I would recommend Southern Crossings to anyone seeking a well-organized trip with staff members who truly care about the travel experience of their clients. I’ve traveled to Latin America a number of times, but I have never had a better experience. Thank you for a trip I will remember forever! I travelled in Peru alone. Due to the nature of my husband’s job, he couldn’t join me in Peru. There was NEVER a time in Peru that I felt my safety was in jeopardy, even with the very serious strike situation that was occurring in Cuzco at the time of my trip. The employees and organization of S.Crossings has been flawless. You did a fabulous job arranging quality guides and accommodations. Highly recommend you for families that like activities and have teens. Hard to find a company that gets that. The guides were very flexible and so we saw and did what we wanted and not a canned tour. It was perfect! From the moment we hit the ground, we were treated not like clients but like visiting friends. This was the best way to see the fascinating geography, history and culture. I went on the “Ultimate Inca Trails” trip with Southern Crossings. I still look back on that trek as being one of the most beautiful and inspiring experiences of my life. I had never been so connected to nature before; the scenery was incredible and the pace was challenging, but not overwhelming. One night as we were setting up camp, a meteor flashed across the sky, lighting up the entire valley. We bathed in natural hot springs, and visited ruins that were virtually unknown to the regular tourist trail. It was like nothing I had ever experienced before! I will always look back on that trip as being one of the most inspiring experiences of my life. Wonderful holiday in wonderful location. Southern Crossings were superb in their organisation and interaction with us; always supportive and available but never fussing. They made all the difference to our holiday and we would recommend them to anybody who wanted a special holiday in Peru. I have wanted to see machu picchu since I had done a report in 5th grade. Being able to see it, feel it, smell it, walk it, was beyond anything I could imagne. All of our other stops reenforced the incredible sights and sounds and left us wanting to see and do more. All of our guides were fantastic, amazing,great, funny, wonderfully knowledgeble, and caring. They truely made our trip one of a kind. If you ever consider going to Peru, use Southern Crossings. We have recommended them to everyone we’ve talked to since our trip. We always felt connected with them in case we ran into problems, but yet still felt like we were exploring on our own. Would not hesitate to let them plan our next trip, which will probably be Mexico. We would travel with Southern Crossings again and can recommend them to anyone confident that they will have a wonderful time. The attention to detail that was put into our vacation was obvious. Every portion of our trip was seamless. The trip was wonderful! Everything went so smoothly from start to finish with you guys… the Amazon is something everyone should try as soon as they get a chance! My mom and I were amazed at how great the resort and the whole jungle experience was. Also, the staff, food and living conditions were great too (no bathrooms in the middle of the jungle that we had to walk to with the help of our flashlights)!!! Anyway, I just wanted to thank you from our end for making the trip so relaxed but exciting at the same time! We had a blast and hope to make it to the rest of Latin America some time in the future.